Little Bean Workshop: Rainbow Party! A close-up of the dipped oreos, yummy. And I got the most adorable printables for the party. See below for resources. A close-up of the cake, which of course, I did myself. I have to thank pinterest for the inspiration! 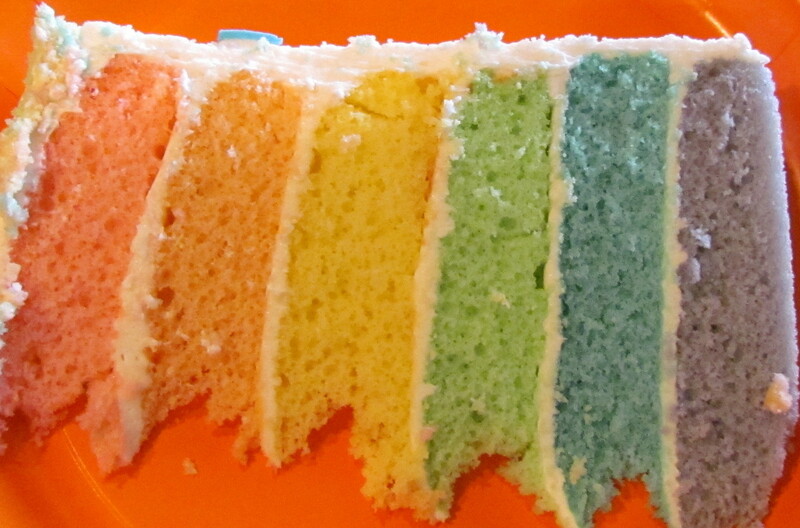 And of course, the inside was rainbow too! Above both of the tables, I hung paper lanterns in rainbow colors! And here is Bean in her rainbow party dress...complete with blue shoes and rainbow hair clips. Pinwheels made with rainbow scrapbook paper in vases filled with rainbow sixlets. Since we were having this party in late October, we cannot count on the weather to be decent in any way. So, I decided to provide crafts for the kids to do to keep them busy. They seemed to be really successful. First, I did a Froot Loop necklace craft (hint: don't use yarn as I did, find some cording, it will be easier to string the cereal on). Second, I did a cloud with a rainbow craft. Super simple and inexpensive, but the kids really enjoyed them. A close-up of the lanterns over the party table...I didn't want to put holes in my ceiling, so I just tied them all on to my chandelier with fishing line. Rainbow Sixlets - Oh Nuts! I am obsessed with rainbows too! Great job tying your theme throughout. Loved the raincloud craft!! My princess turns 3 in February!! Yay! My son turns three on Thursday-such an exciting time :) I love all of the rainbow stuff- good job of doing a theme tastefully. Wow, this is awesome! I am doing Rainbow Week with my kids next week. I love your ideas! Thanks so much! It was a lot of fun...can't believe it's almost time for the next party...eek! I love your make your own rainbow station. What a sweet idea.